Now that the snow is finally melting from the patio, it is time to think about gearing up for spring and summer. For families throughout Massachusetts, this means mowing the lawn and starting up the grill. As you pack away your snow blower for the spring and summer seasons, you should also be wary of the potential risks of storing and reigniting this equipment. Our personal injury attorneys in Boston are committed to preventing accidents and raising safety awareness. Here are some spring safety tips when trading out your winter for summer equipment. Stabilize your snow blower. Before you store your snow blower, you should add gas stabilizer and let it run to ensure that it circulates through the carburetor. This will prevent “gumming up” of the gas. Close the valve to prevent a major fuel leak. You should also change the oil in the snow blower while your snow blower is still warm. Always remember to remove the spark plug wire when performing maintenance. Check your lawn mower for fuel leaks. It is not uncommon for a mouse to make a nest in the muffler area. Before starting make sure the mower is clear so that you don’t start a fire, which could become explosive if near a fuel line. Mice could also damage the line so make sure there is not damage to equipment. Get proper mower safety equipment. You and your loved ones should wear protective gear when operating a mower. Safety gear includes a hat and protective eyewear, hearing protection, and a dust mask. Anyone mowing the lawn should wear pants to protect the legs as well as sturdy shoes to ensure that you do not slip. Mowing barefoot or with flimsy sandals can cause serious injury, quickly. Keep children away from a lawnmower. If you have young children, make sure they do not go near the lawnmower, especially if it is running. If you ride a tractor, be wary of the dangers associated with riding with a child on your lap. You should have both hands on the steering wheel and you need to be able to turn off the motor quickly in the event of an emergency. Only add fuel to cool machine. Do not add any fuel to a lawn mower if your machine is hot. You should always add fuel to the mower before you begin mowing. In the event that you do run out of gas, you should let the machine cool before adding fuel. No one should smoke near the machine, especially when you are fueling. Never disable any safety features. These are in place for a reason. Tampering with a kill switch could cause serious or fatal injuries in the event of a runaway mower or in the event of other complications. 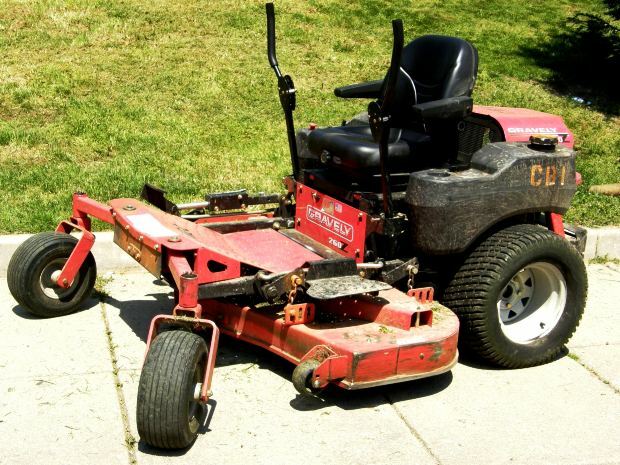 When transitioning your lawn care equipment for summer, remember safety is key. You want to make sure that equipment that is out of use is safely and properly stored. You will also want to make sure that your lawnmower and other summer tools are in proper working condition and safe for use. To prevent future injuries, it is best to be prepared and aware of the dangerous injuries we may face with maintenance equipment.